Publishing photos of my child online - Why I am OK with it. This topic has raised some recent discussion - see here for Guardian article on the safety of posting children's pictures online. They ask "... is it safe, or even ethical to publish something about someone who can’t give their consent? " A blogger perspective comes from Ma Che Davvero who suggests it is an abuse of their privacy. There are several ethical choices every parent makes in their everyday lives, and posting photographs of them online are no different. Of the examples I've outlined I see posting pictures online as the most minor infraction on the children's self-determination... Choosing your kids religion for them sounds like by far the greatest ethical dilemma in my books as it can affect their whole perspective on life! 2. I think my child will be happy about her online presence. Have you ever had a look at your own baby books - those little achievement books your parents were supposed to fill? They are lovely to look through, and I only wish my parents had been a bit more active with noting down my first achievements. I think my baby will be happy that there is so much information of her readily available, for her to peruse, and pictures of her development through the days and the months and the years of childhood. And should something happen to my computer or the picture books of her, many of them are saved on internet, be that Facebook, Instagram or my blog. 3. The internets is not a scary place... I feel the "real" world and internet are increasingly intertwined and internet is just as "real" as the IRL-world. I am the same person online as I am in real life. And I think this interconnection between internet and the real world is going to become stronger in the future. As such, our children will probably find it strange that we have ever pondered about things such as anonymity on internet, or whether we should post pictures of ourselves on internet. They will probably think of trying to hide your online presence as something akin to putting a bag over your head every time you walk out of the door. 4. 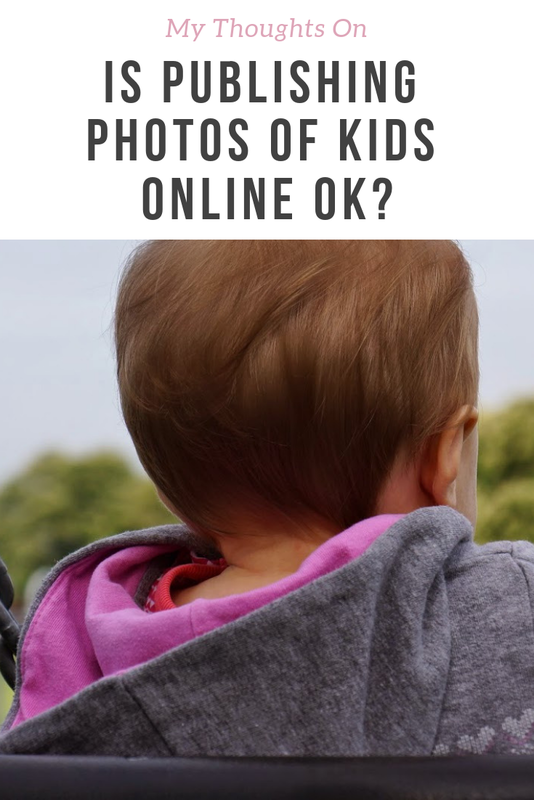 There are lots of pictures of kids online... And no-one pays too much attention to them. Everytime I see a picture of someone else's kid online I look at it, think, oh there's a kid, and by the time anything has registered in my brain I have already scrolled past it and forgotten about it. I would suggest most people are like me. Most people aren't sinister. They are just scrolling through the endless content on internet. And as for the sinister people... Well. I would be far more worried about them in real life, in the park, in the swimming pools, in your schools, in your homes... But you can't live your life in fear, otherwise you would stay indoors, back home all the time. While you can take pictures of your kid without showing their faces, making it unclear what they look like (I sometimes see this in blogs), aren't the pictures that show their little smiles and expressions, and personalities just so much better? Purely in terms of photography, I think showing the face adds to the imagery and atmosphere of the photography. Anyway, many of the photos I publish online are there to bring joy to her grandparents and other family members that don't get to see her that often, and it would be terribly boring if they ever only saw her toes, or the back of her head. I think the real questions is not about to share or not to share, but about what to share. I share pictures I find beautiful, and stories I find endearing. I would never post something I think would embarrass my child. What do you think - is it OK to publish photographs of your child online? Can they have an online presence? Why / why not? Its a hard one, I agree. But I too publish photos of my children online. I love showing them off, seeing the comments flow in and looking back at blog posts and old photos of them online. There's a lot of debate about this, but I agree completely with what you say. The internet is no scarier than the IRL world, and you need 'web smarts' just like 'street smarts'. I don't publish anything about my baby that I wouldn't want published about myself (such as horribly embarrassing photos or personal details). Web smarts - definitely - that is exactly what I was going for. People have different viewpoints to internet, I know some people that find it strange meeting people off the "internets" but I've met lots of good friends through internet. And many people have met their partners etc. In many ways it compares to IRL world. I had another blog when my lil one was born - it is a lovely thing looking back at the posts later on, and looking at what we used to do when she was still a little baby :) The pictures make it much more special I think. Difficult subject and one that people have a lot of varying opinions on. I think the parent knows what is best for the child, so has the choice. On my blog, I have photos of the little one who is 9 weeks old, but will probably make them more half face / over the shoulder etc as she gets older - similarly, I do this with photos of myself and the missus as I blog semi-anonymously. Likewise, I wouldn't post naked pictures, or otherwise unpleasant pictures (like I doubt I would post a picture where they are sick etc. ), you have to draw a line somewhere. And that is mine (mainly because I would feel uncomfortable having my naked pictures out there!). Definitely - you shouldn't publish pictures of other kids without their consent. Well, legally I believe you can have kids in your pictures too, if it is a public place and they just happen to be in the picture rather than the main focus. With your own kid you can make those choices, but not with others. That is fair enough - each to their own. What I find strange is if bloggers won't share their own pictures but do with their kids - you sort of think if the person is concerned of their own anonymity why aren't they concerned for their kids as well. I think that as long as you're 100% comfortable with it, it's fine. But if you have even a shred of doubt, it's best to avoid it as you can always let the cat out of the bag later (as it were). The only no-no for me is publishing photos of other people's kids without their agreement. But when it comes to mine, I've always been happy to post photos of my kids as long as they're in good taste - if I'd show my mother, I figure it's fine. That works well for anything you write or post online - if you are happy for your mum and employer to see it, then it is fine to post. Nowadays when the online and "real" world mix it is even more important to really think what are you putting out there, and to be 100% comfortable with it. Mine and my husbands opinions on this matter differ dramatically. I have no problem with it, but before I even started m blog he made it clear that he did not want me to use photographs of our daughter, or use her real name. I asked my husband this once, and he said that at first he was a bit uncomfortable, but then he thought that pictures are just pictures. I can understand both sides of the debate, and can definitely understand why some people are cautious of sharing pictures online. This is definitely a hard one. I am pregnant currently and intending to blog about our adventures when baby is born, but I have been stuck on whether to put up photographs of the little one or not. I think as long as you are comfortable with it then that is what is important! I don't use pictures of my kids where you can see their faces, but that's only because I started my blog as an anonymous blog (which has started to annoy me recently because I can't share certain things if I want to remain anonymous when in actual fact I dont think I do anymore) but if I did I wouldn't mind sharing them on my blog. I worked for the police and with high risk offenders, including paedophiles, a lot and they weren't interested in images of children doing normal things, so the argument about 'dirty old men' wanting images of our children if we share them is always lost on me. As for their 'digital footprint' it's almost like getting the photo album out and showing their friends and boyfriends pictures of them as a child, like our parents did to us, yes it's embarassing for about five seconds, but who cares if a stranger sees a picture of you as a baby, you're only going to care what people who know you think and like I say a five second embarassment soon gets forgotten about and if not our kids will see just how much we adored them by sharing pictures of them and creating an online diary about them. Thanks for the well-informed comment - I have always wondered what would people "in the know" say about the "dirty old men" argument, and I always sort of thought that would be it. Yeah, I sort of agree with you there in that digital footprint isn't much different than a photo album, just more readily accessible. I never found the pictures from my childhood embarrassing and didn't have a problem with other people seeing them. What I found and still find really embarrassing are the pictures of me as a sulky teenager :) But luckily, if I still blog when my little one is a teen, I can ask if I can share her pictures. I love the idea of a blog as an online memory book, or a sort of a visual diary. It is much easier to show your family too, and nice for them to get a look into your life through pictures. But definitely, it is such a personal thing, and at the end of the day, it is your blog (or whatever internet-corner you have parked yourself in) and you do what you want with it!